Ani was acclaimed as being “the magnificent city of thousand and one churches”. It was the last capital of the Armenian Kingdom of Bagratuni (9th –11th century). Then Seljuk-Turks razed it to the ground, including the libraries, and destroyed many thousand illuminated manuscripts – treasures of the art of miniature painting in which the Armenian scribes excelled. During the first half of the 13th century, the Mongols invaded Armenia and captured whatever was left of Ani. Slaughter, captivity, drought and earthquakes finally forced the Aniites to leave their motherland. Thus began, in the 14th century, the exodus of more than 30 thousand families. Their Odyssey brought them first to the valleys of North Caucasus, then to the banks of the Volga River. Proceeding further west, one group advanced to the north, eventually settling in Ukraine, Moldavia (where Hovhannes Aivazovsky’s forefathers had settled), Galicia and Poland. But a larger group pushed its way to the south, and after a long period of prosperous stay in Crimea, they were uprooted, once again, during the Russo – Turkish war, at the close of the 18th century, The odyssey of that community of merchants and artisans ended on the banks of the River Don, Thus the descendants of Ani built their city of New Nakhichevan, and settled there, near the Sea of Azov, next to Rostov, in 1799. New Nakhichevan soon became the birthplace of many Armenian legendary figures that pioneered the cultural, political and artistic renaissance of the Diaspora and of the mainland Armenia. The first of those “legends reborn” was Michael Nalbandian (1829-1866), the philosopher-poet of freedom and human rights. Nalbandian died in exile in a Tsarist prison camp. In 1880, when New Nakhichevan was 101 years old, Martiros Sarian was born in a carpenter’s family, the seventh of nine children. 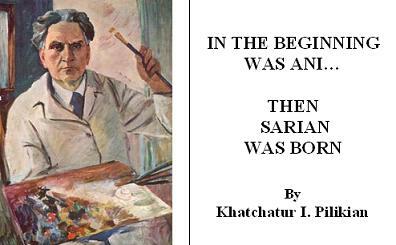 In 1903, the young painter Sarian graduated from the Moscow School of Painting, Sculpture and Architecture. 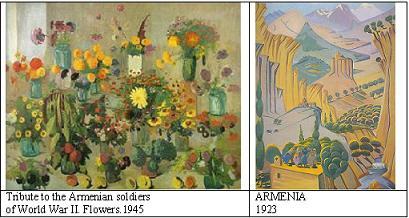 In time, Martiros Sarian became the acknowledged master of Armenian painting for 65 years. He had participated among others in the Blue Rose Society Exhibition, Moscow 1907; the 2nd London Post Impressionist Exhibition, 1912; the 14th Biennale, Venice 1924. He was awarded the Grand Prix of the World Exhibition, Paris 1937; the Gold Medal of the World Exhibition, Brussels 1958; Four Lenin prizes, 1945; 1950, 1961, 1970. He was made Hero of Socialist Labour, in 1965. 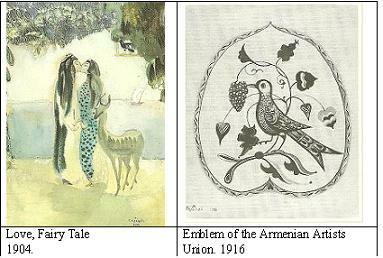 Sarian first visited Armenia in 1901. He also managed visiting his ancestral city Ani, in 1902. Then, in 1915, he was in Echmiatzin to organize help for the Armenian children orphaned as a result of the genocide of the Armenians in Turkish Armenia during the World War One. In 1921, his friend, the first Prime Minister of Armenian SSR, Alexander Miasnikian, who also was born in New Nakhichevan, invited Sarian to be the first director of the State Museum of Armenia. Having assumed the post, Sarian and his family permanently settled in Yerevan, the capital of Armenia. On 26th of November 1967, a House-Museum, named after Martiros Sarian, was opened in Yerevan. It has since become a national treasure house. Sarian died in 1972, and was buried at the Armenian Pantheon, in Yerevan. This is the story of a great grand-grand-grandchild of the Aniites, and his thousand and one colours. The Armenian inhabitants of the region Agn, in Historical Armenia (Egin, now Kemaliye, in Turkey), were mostly descendants of Ani, the ancient capital of Armenia captured by the Mongol invaders in 1236. The Aniites having become Agnites for three centuries were uprooted anew, this time by the Ottoman Turks, during the 16th century. Hence the name Khaskal of the original village in Agn, was given by the Armenian immigrants from Agn to their new settlement in Izmit-Nicomedia, neighbouring Constantinople in Anatolia. The new Khaskal, meaning “good-fields”, proved worthy of its name. It soon became the ‘Paradise’ of the region, especially for the pilgrims of the celebrated Armenian Monastery of Armash. (S. M. Dzotsikian, Arevmdahay Ashkharh [Western-Armenian World], New York: Dzotsikian Jubilee Committee, 1947, p.484). Centuries passed, then most of the Khaskalites, those great grand-grand-grand children of Aniite Agnites, were uprooted yet again, this time to become victims of the ‘first final solution’ of the 20th century—The Genocide of the Armenians, perpetrated by the proto-Nazi government of the Young Turks.